Worst invasive reptiles: Florida’s exotic pythons, anacondas, monitors, tegus. Which Exotic Species are Really Scary? People are terrible at spotting Burmese pythons, one of the United States’ most dangerous invasive species. Some of the world’s biggest and deadliest reptiles have been found in the United States where they don’t belong, including Nile crocodiles, Burmese pythons, and green anacondas. In fact, all of them have been found in Florida alone. The swampy wilderness of south Florida is hot, muggy, and a great spot for reptiles from all over the world to settle in and get comfortable. You might think that it would be difficult for a beast from the jungles of Africa, Asia, or South America to find its way to Florida, but it’s not. In fact, a few hundred of them may have been in the cargo hold of the last airplane you flew on, either smuggled, shipped here legally for the exotic pet trade, or as stowaways. If they escaped, any of them could end up wreaking havoc on native ecosystems and contributing to the $120 billon worth of environmental damage that non-native species cause in the United States each year. Or, they could end up doing nothing at all. Unfortunately, it is very difficult for biologists to tell what risk a non-native species might pose to the United States before it is too late. Miami International Airport is a major hub for the wild animal trade, legal and otherwise, and make no mistake, the scale of global animal trade is almost beyond comprehension. The organization Defenders of Wildlife estimated that on your average day between 2000 and 2004, “the United States imported … 588,000 individually counted animals plus an additional 3 tons of animals that were weighed, not counted individually.” That’s more than 4 million individual live animals each week plus 21 tons of animals nobody bothered to count. Many are not even identified. Most of the animals caught up in this vast international market are destined to live out their lives as someone’s pet. For others, their last stop is a dinner plate. However, the global trade in animals is so huge and complex that we shouldn’t be surprised when creatures slip through the cracks and disappear into the nearby woods. Some of animals imported into this country escape and others are released, but most that make it out of their cages are promptly eaten by a native predator or die a slow and lonely death. Conservation biologists like myself don’t spend much time worrying about these solitary animals, which we refer to as exotic; they are a novelty but not much else. But these exotics become something more concerning if they begin to thrive in their new environments. Exotic animals might start eating native plants and animals while surviving long enough to reproduce and form populations. If they do so, we consider these exotics to be established. Conservation biologists and policy makers pay close attention to established exotics because they can harm populations of native species by eating them or by eating their food. When established exotics start causing this kind of damage, we consider them invasive. The ones we hear about on the news tend to be big predators, like the snakehead in Maryland or the Burmese python in South Florida. Invasive species have been responsible for the extinctions of numerous native species. Biologists are quick to sound the alarm when they detect them so everyone can start figuring out the extent of the invasion and try to stop it before the environmental damage is irreversible. In 2011, the Department of the Interior spent $100 million on “invasive species prevention, early detection and rapid response, control and management, research, outreach, international cooperation and habitat restoration.” This is not money anyone wants to see misdirected or wasted, so if a couple of animals show up, how does a biologist know if a species is invasive or just a harmless exotic? Sometimes the answer is not so straightforward. Describing what we know about one species that has been confirmed as invasive in Florida is a good way of explaining why. The Burmese python is a giant constrictor that can easily reach more than 15 feet long. They have now been entrenched in Florida for decades, although they weren’t identified as a big problem until recently. These invasive pythons are eating everything they can, like raccoons, opossums and bobcats, and they are probably leading to severe population declines in these mammals. Pythons are even known to have consumed federally protected species such as the Key Largo woodrat and the wood stork. Even though we are confident that the Burmese python is an invasive species, there is still a lot to learn. As of now, biologists are struggling to figure out how much of South Florida the population has colonized as well as how many pythons are out there. You might think it would be easy to find pythons and figure this kind of information out if there are thousands of them in the Everglades. But even the largest reptiles in the world are exceptionally difficult to detect. To find pythons and determine the extent of their invasion, scientists have searched on foot, set out traps, and used detector dogs trained to zero in on snake scent. Early this year, Florida officials even organized a Python Challenge that attracted 1,600 aspiring python hunters, but only 68 snakes were captured after an entire month of searching. For many folks, the low number of pythons captured suggested that perhaps the python hysteria was mostly hype. But for us biologists, the real surprise was how many pythons were captured, not how few. Let me explain. Biologists who study snakes often discuss how difficult it is to find our subjects in the wild. Knowing this, Michael Dorcas and J.D. Willson (two snake biologists) recently tried to figure out just how effective people could be at finding pythons. To do so, they placed 10 full-grown Burmese pythons in a 102 by 82 foot semi-natural enclosure containing vegetation, a small pond, and trees. Then, after the pythons had settled in, they allowed 19 people to come in one at a time and look for pythons for 30 minutes each. Although each of the 19 people could have potentially found all 10 snakes (a total of 190 potential finds), only two finds were recorded over the entire study. In other words, even when we are looking for snakes in a small area and know they are there, we probably only have about a 1 percent chance of seeing them. There are clear implications for biologists that study invasive species: If you find a couple of snakes, there could be thousands more, or none. Is the snake you see a single exotic pet or the first clue that there is an emerging threat from a new invasive species? There is no easy way to know for sure, but there are a few criteria we can use. Biologists generally assume that an exotic animal does not represent an established population until evidence is presented to suggest otherwise. One example of compelling evidence would be finding many animals, including at least one pregnant female, in the same location in a relatively short period of time. This is why my friends that study invasion biology scoffed at a recent story suggesting green anacondas had invaded Florida. Sure, a handful of these animals have been found scattered across the state, but there’s no reason to think they were anything other than just a few escaped pets. This does not mean, however, that biologists ignore sightings of exotic animals. Over the years and in large part because of what was learned by studying the Burmese python invasion, biologists have carefully recorded and tracked sightings of exotic animals found in Florida. This allows them to map the animals’ locations (as here for large constrictors like boas, pythons, and anacondas) and get a head start on heading off potential invasions before they get out of control. They’ve also established a toll-free hotline (1-888-IVE-GOT-1) that people can call to report large snakes. There are 200 people trained to respond to these calls; the hope is that a fast response will allow the capture of any exotic animal and help stop impending invasions before they explode. Most of the time, it might be safe to assume that any exotic snake or crocodile found in South Florida is just an escaped pet, but that doesn’t mean anyone is taking any chances, billions of dollars and the safety of our native ecosystems is at stake. Florida’s established exotic reptiles include crocodilians, chameleons, large predatory lizards, large constricting snakes, and even two species of lizards from Asia that are called bloodsuckers (despite their ominous name, these lizards feast on insects, not blood). Some of these species are considered invasive because of their effects on the ecosystem. As someone who grew up learning about these animals on wildlife documentaries and then years later got a Ph.D. studying native reptiles in Florida, I find the thought both terrifying and exciting. The Burmese python is a clear-cut case of an invasive species, but what about all the other reptilian giants that have been seen in South Florida? Here is what we know about a few of them. Green anacondas: This beast hails from tropical South America and claims the title of heaviest snake in the world. Only about four have ever been documented in Florida. Because of their scattered locations they are probably pets that escaped in independent events. Verdict: Exotic. Yellow anaconda. The green anaconda’s slightly smaller cousin; again only about four have been found in Florida, but three were found relatively close together and over a short time span. However, there was no evidence of reproduction. Verdict: At least exotic but they are possibly established in South Florida. If true, they have the potential to become invasive. We basically don’t know much about the status of this species in Florida. 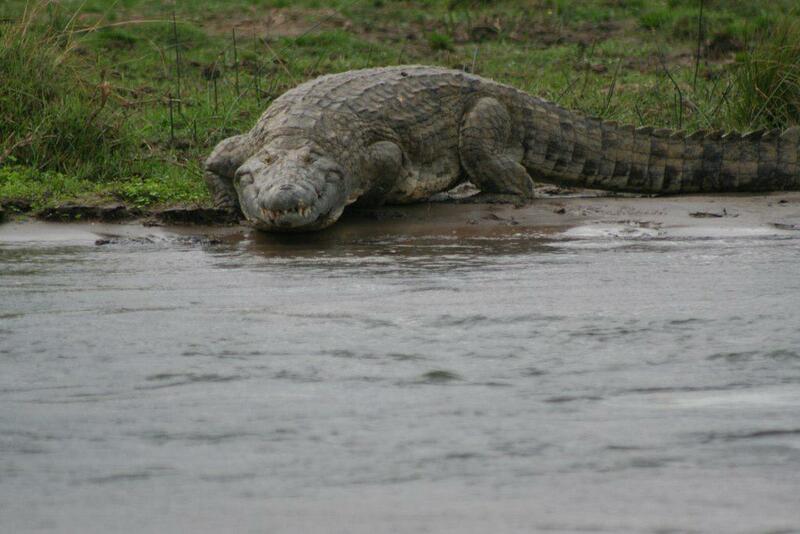 A Nile crocodile in Zambia. Photo courtesy of Flickr user Paul Kane. African python: This large constrictor has been showing up in west Miami near the Everglades, and a few very young individuals have been confirmed together with evidence of reproduction. Verdict: Established in South Florida with the potential to become invasive. Courtesy of Flickr user Mike Baird. Black and white tegu: This large lizard from South America can reach 4 to 5 feet long and has an appetite for just about anything it can fit in its mouth. This species is now becoming increasingly common in south Florida and there is concern that native gopher tortoise populations might be susceptible to this egg-loving lizard. Verdict: Established and likely invasive in South Florida. Reticulated python: This beast from southeastern Asia is the longest snake in the world. Fortunately, although escaped individuals are found somewhat regularly, there is no evidence to suggest they are breeding in Florida. Verdict: Exotic. Boa constrictor: This South and Central American animal is very popular in the pet trade. It was only a matter of time before enough of them escaped to establish a breeding population. The Deering Estate, a 444-acre preserve in Miami, has contained a population of boa constrictors for decades. Verdict: invasive, but for the most part the affected area is relatively contained, for now. Nile monitor: Picture a Komodo dragon and you’ve got a pretty good idea what you’re dealing with in a Nile monitor. This hulking beast of a lizard can reach nearly 8 feet long and is a voracious predator of any creature smaller than itself. Nile monitors have been documented from seven different counties in Florida, and a few established populations are known: in West Palm Beach, Cape Coral, and probably also on Homestead Air Reserve Base. Biologists fear the lizards are preying on native burrowing owls, among other animals. Verdict: A South Florida invasive.